I bought several yards of this sturdy waxed canvas on Biashara Street in Nairobi a few years ago. 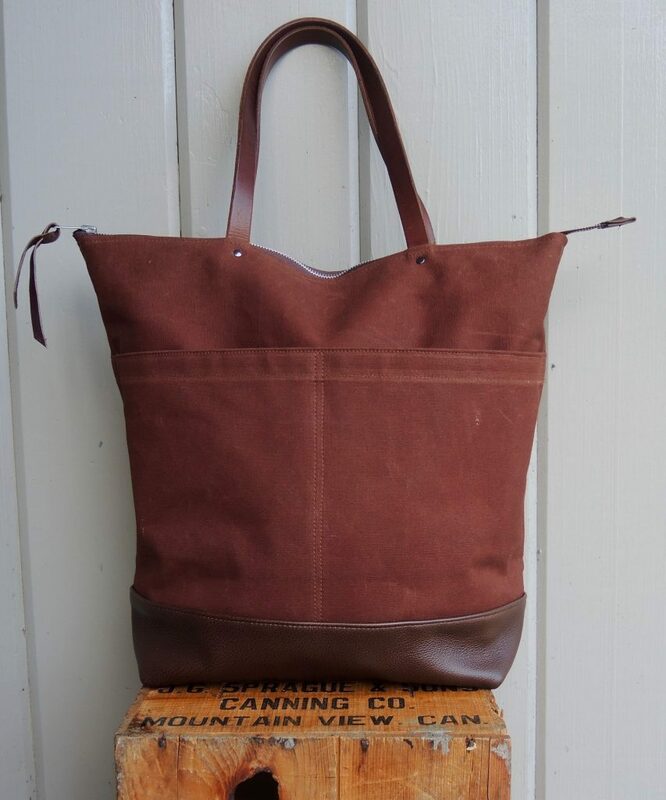 It makes a sturdy and handsome travel tote when paired with leather handles and base. 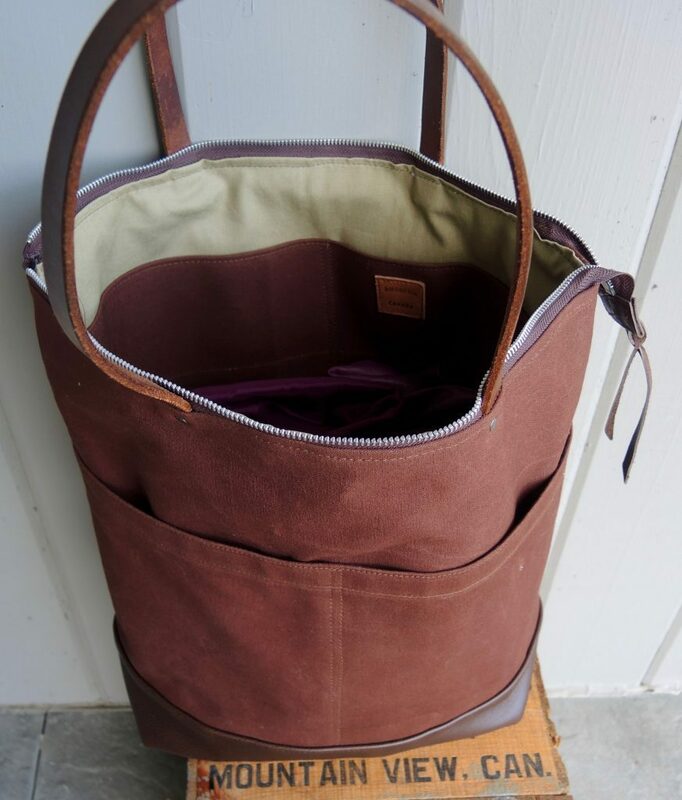 This tote has lots of pockets inside and out and a metal zipper closure, making it an ideal tote for travel or home. 17″x15″x6.5″. 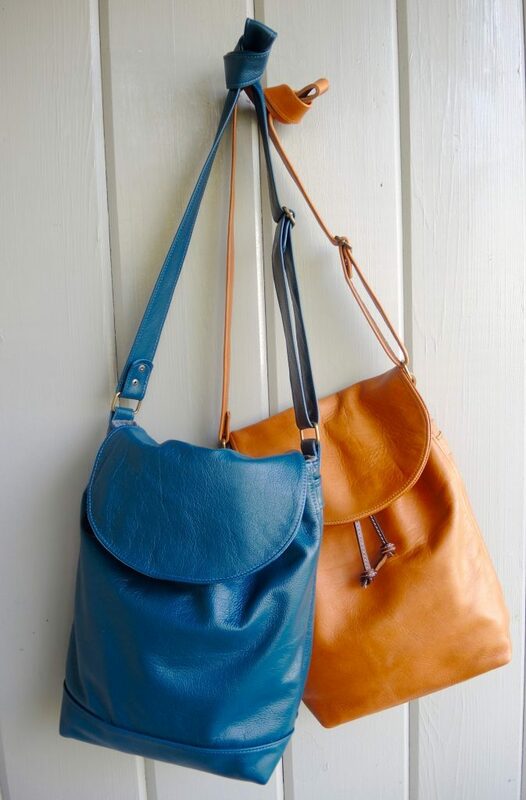 Here are two more Ottawa bags in tan and teal. 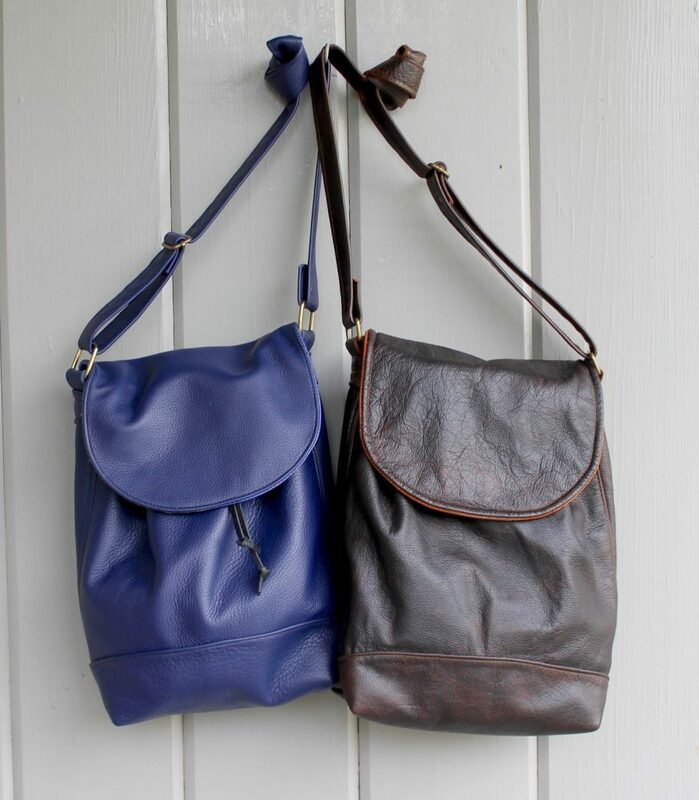 These bags have the same features as the previous bags–zippered exterior pocket on the back, interior pockets including a zippered one, adjustable strap, double bottom and draw-string closure. 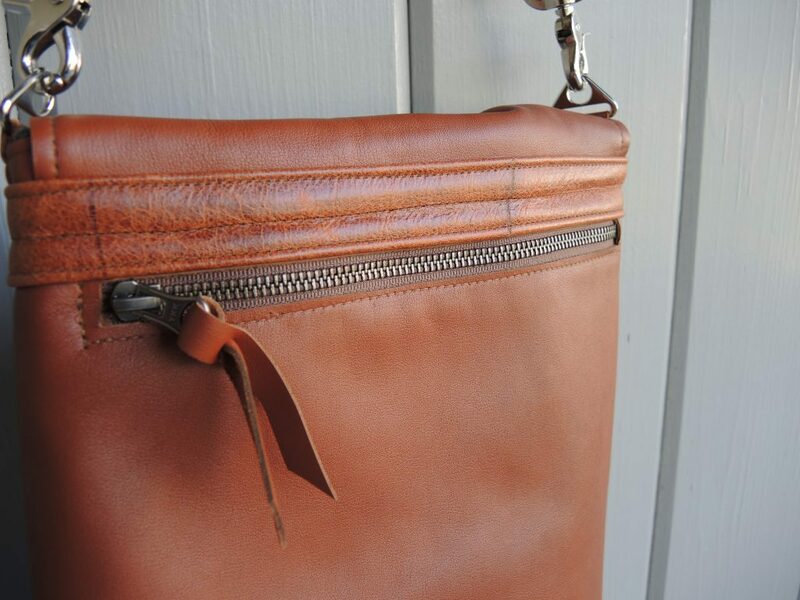 I enjoy choosing a contrasting leather for the inside of the flap and a great combination for the lining. After all, these are the pluses of buying handmade–the little touches that make you smile each time you use it. It’s always good to look back at your work. I had a chance to check out this 1510 backpack which has been in constant use for two years. Here it is brand new. 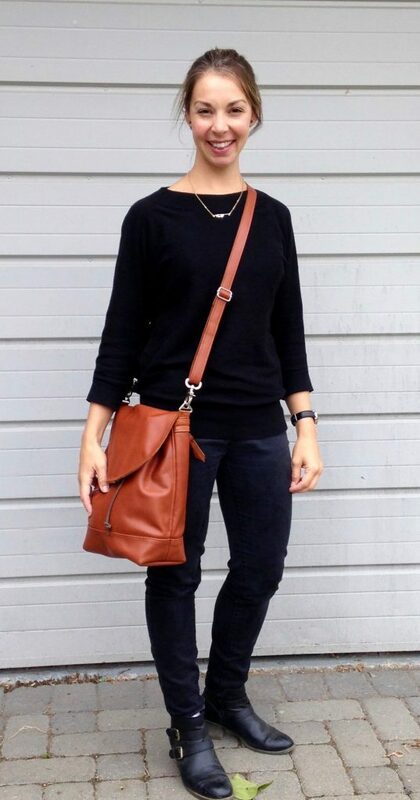 I’ve made a handful of these bags in both black and tan, but this was the first. It incorporates a used Diesel belt as its closure–so in that way is one of a kind. 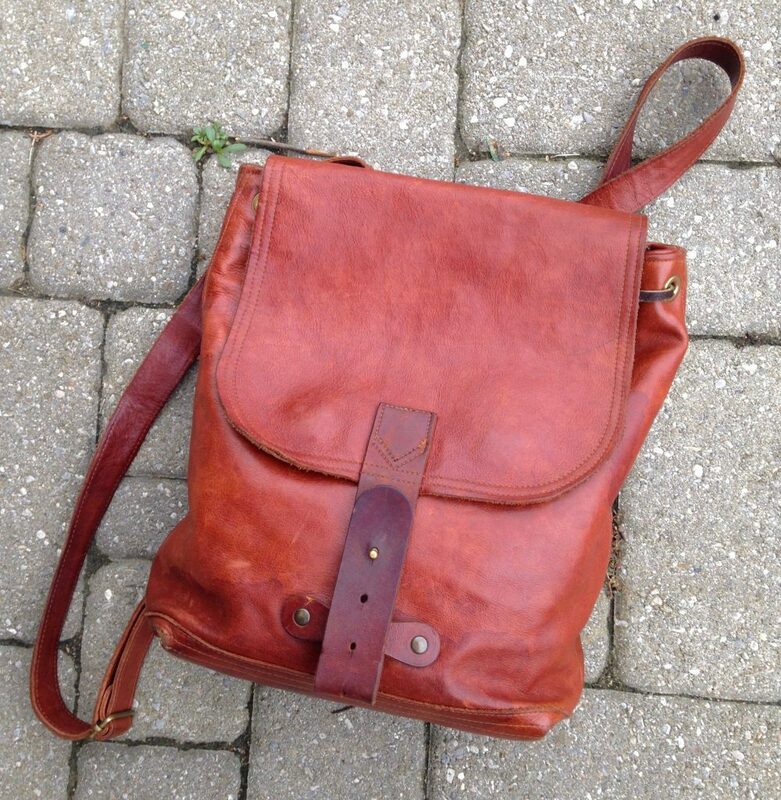 The leather has a few stains but overall has improved with age. The Ottawa bags I’ve been making this week are direct descendants of this design. I have two more to show you in the next post. This is the fifth in the series of Ottawa bags. With each bag, I think this is my favourite. 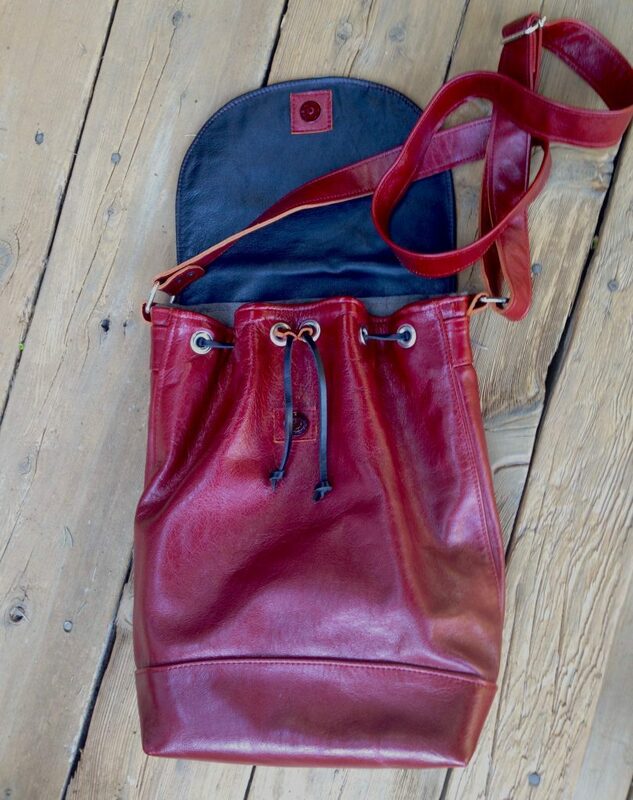 This one is made of beautiful smooth oxblood leather and lined in cotton from the market in Limoux. 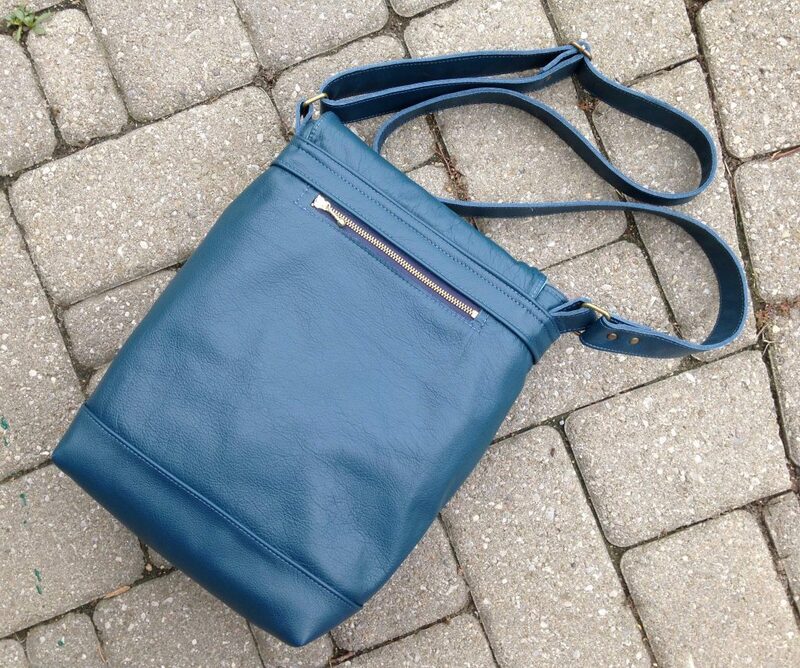 Like the others, it has an exterior zipper pocket, slip/zip pockets inside, a double bottom and an adjustable cross-body strap. 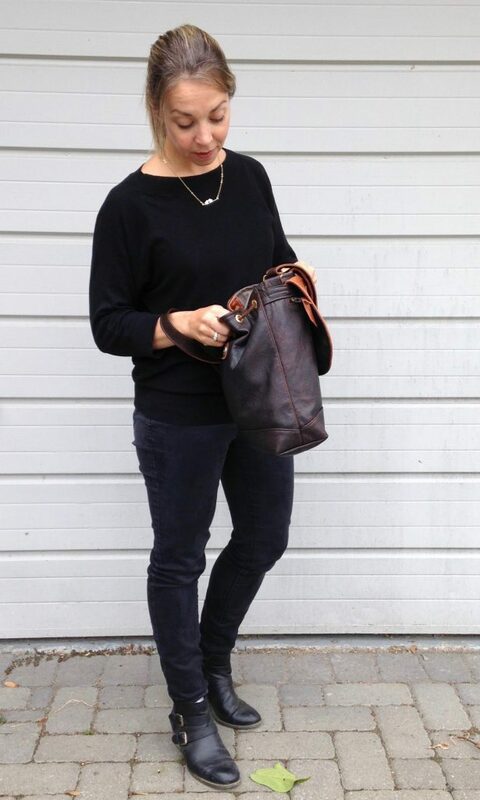 The flap is lined in smooth black leather that was once a skirt. 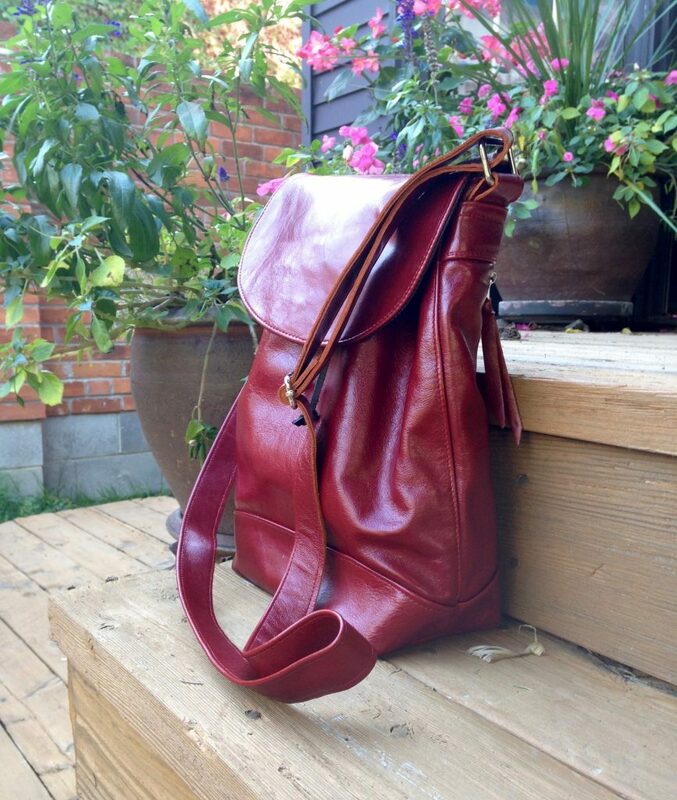 It is a great blend of beautiful colour and texture, a year-round bag that will carry all you need for years to come. 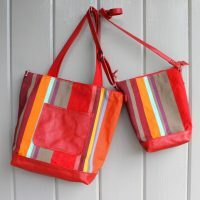 I’ve been using my orange Ottawa bag non-stop since I made it. It’s so easy and comfortable to wear and it carries all my essentials. 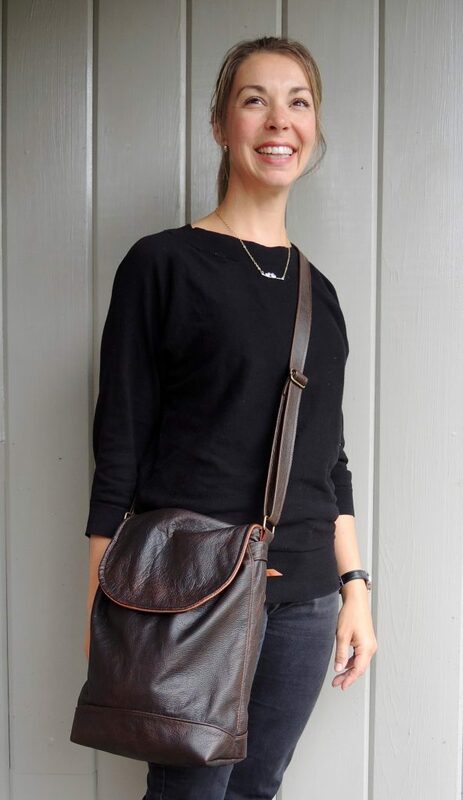 I wear it as a cross-body, but it adjusts to a shoulder bag or shorter. Since the first one, I have made three more. Below is the espresso which you saw earlier, and the new cobalt. 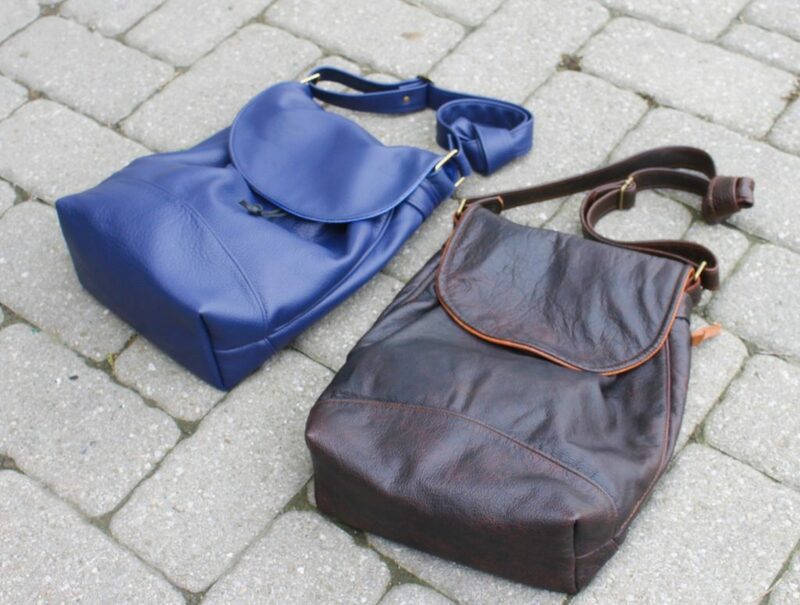 Both of these leathers are rich colours and have great texture. 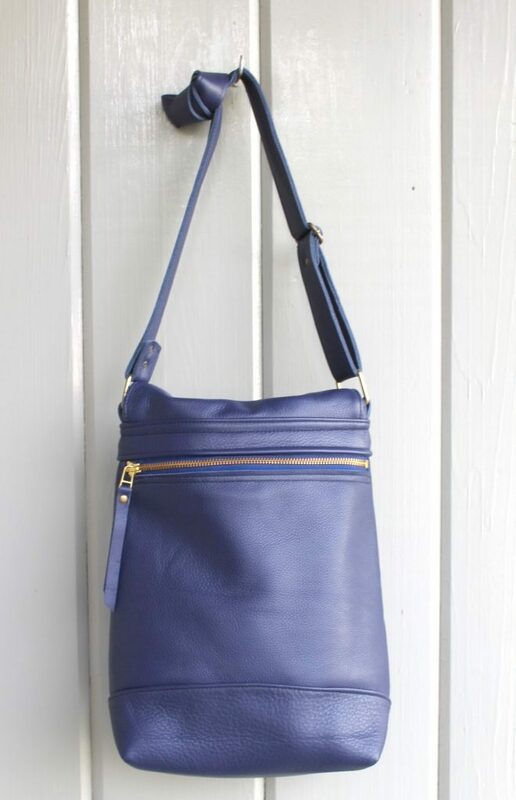 The contrasting leather under the flap is an added feature–in the cobalt bag, the leather lining is made from a recycled skirt. 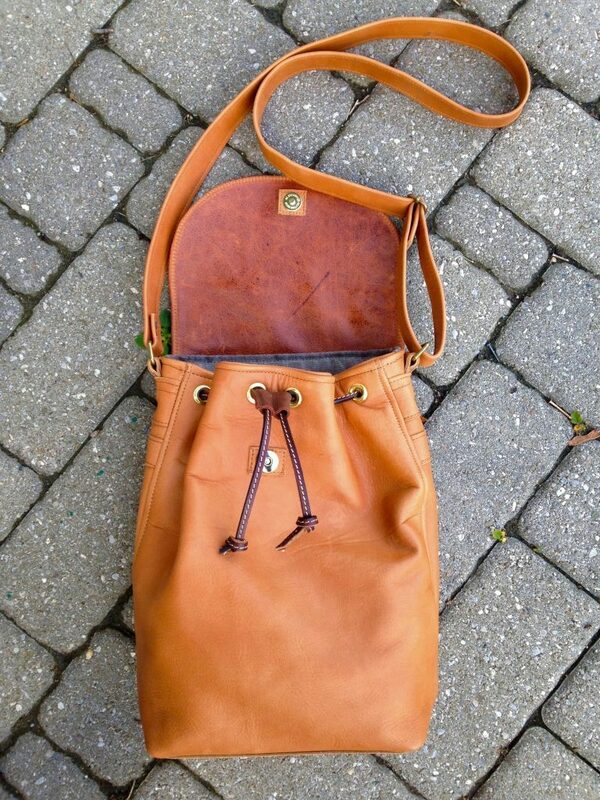 I love to incorporate gently used pieces of leather in my work. Like the others, these bags measure 12″x13″x4.5. They have a double bottom, an adjustable strap, back zippered pocket and zip/slip pockets inside and durable metal hardware. I think this style is a winner and I’m hoping to make one or two more. Contact me for more information. Here is my favourite model is wearing two new Ottawa bags. These photos are great for giving an idea of the size and wearability of the new design. It’s easy to carry and holds a surprising amount. The zippered back pocket is secure and perfect for your phone or keys. 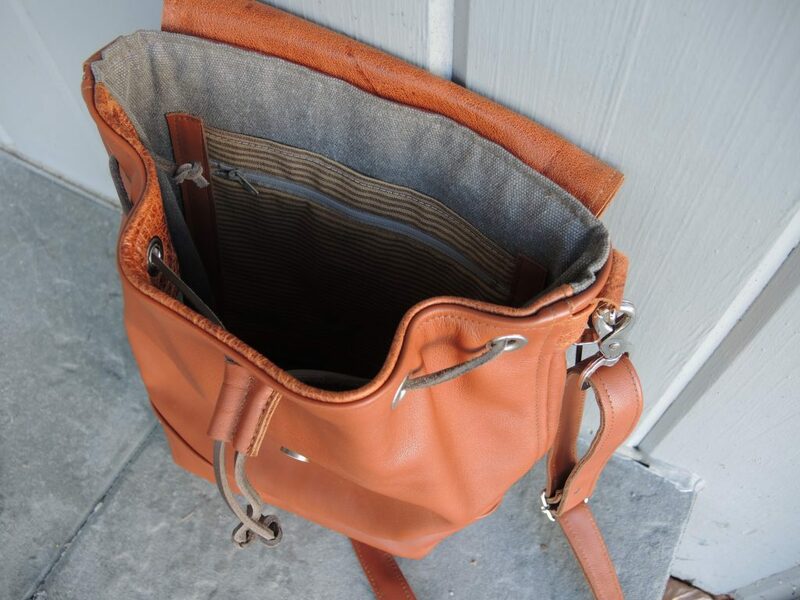 Inside there is another zippered pocket and two slip pockets–so lots of help organizing. 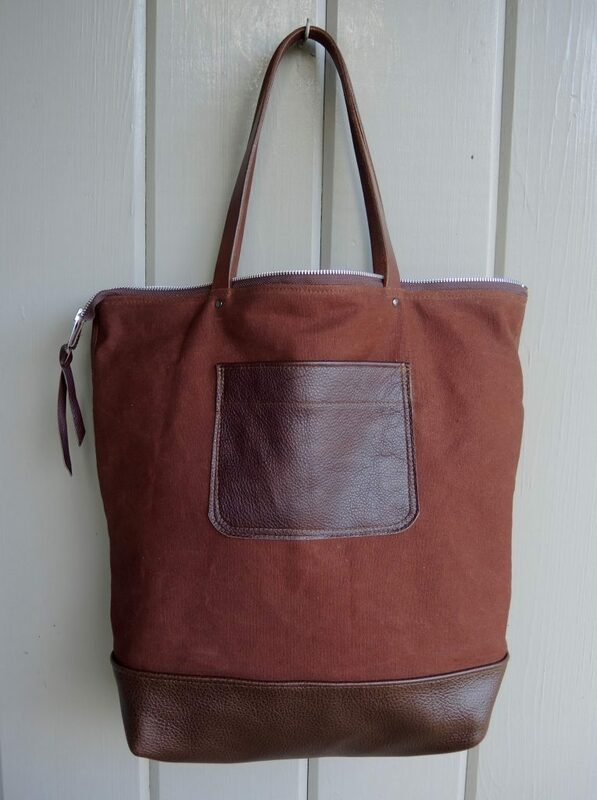 The top bag in beautiful espresso leather, with the backside of the flap in caramel, is in the online store. You can see another view in the last photo. 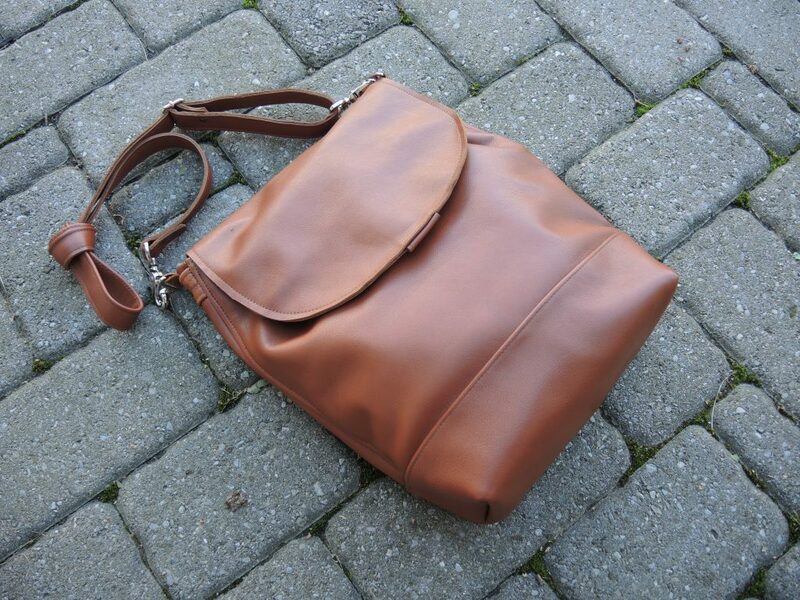 The bottom bag in caramel is sold–the photo is here for reference. 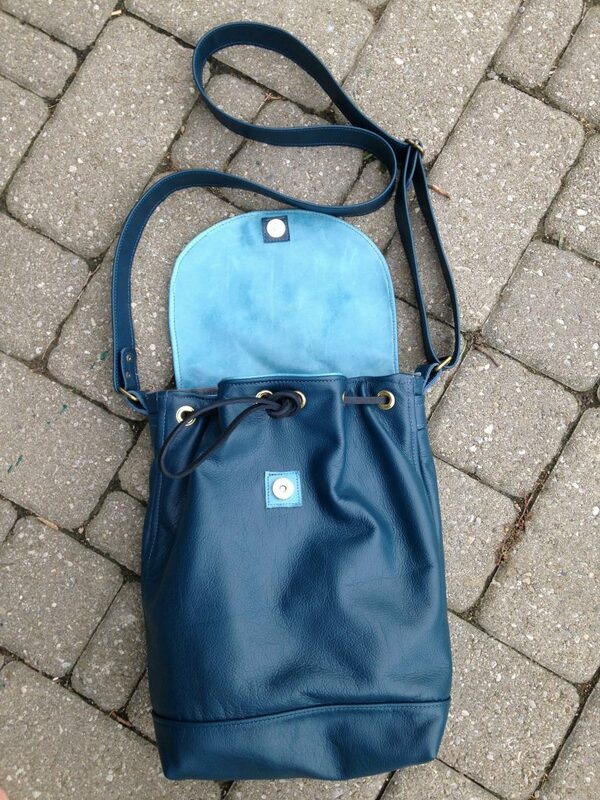 New Ottawa bags will be coming in slate blue and caramel. 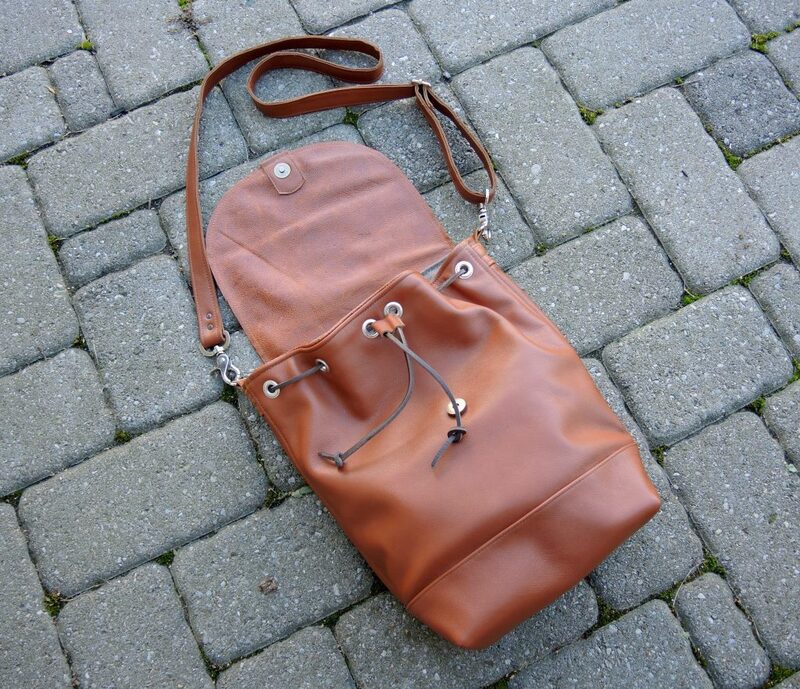 Here is the second Ottawa cross-body bag. I have been carrying the prototype non-stop since I made it. It is a great size and easy to carry. 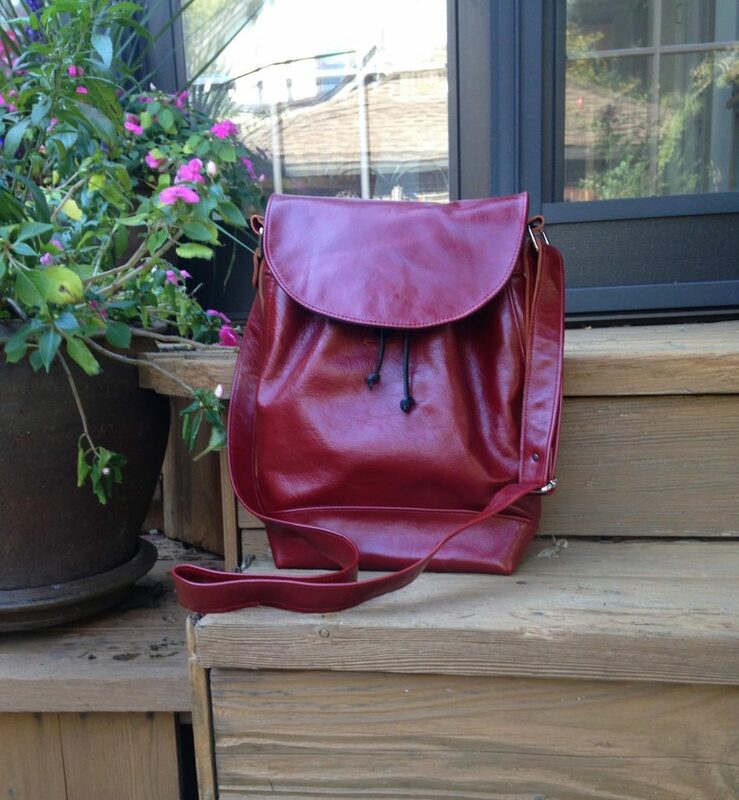 I like the leather drawstring closure and magnetic snap. 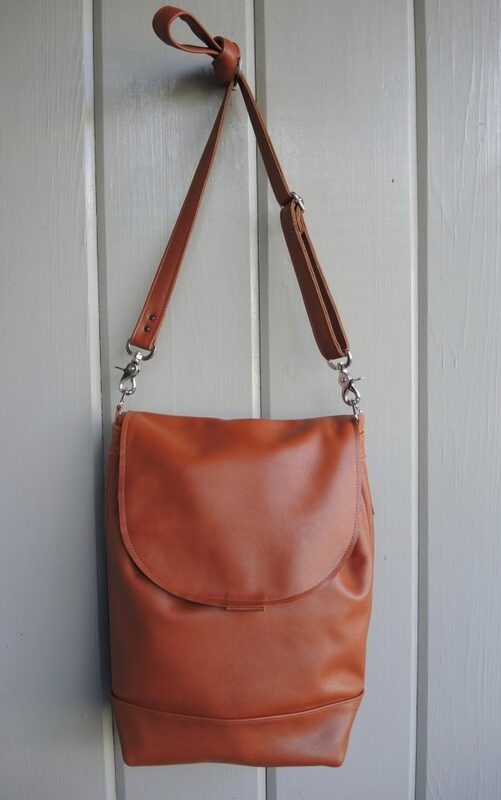 This one is lined in durable tan cotton from the market in Limoux, France, with a leather phone pocket and a zip/slip pocket inside. 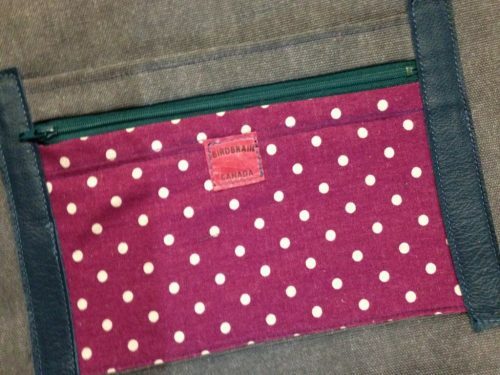 On the back there is another zippered pocket, a handy and secure spot for keys or phone. 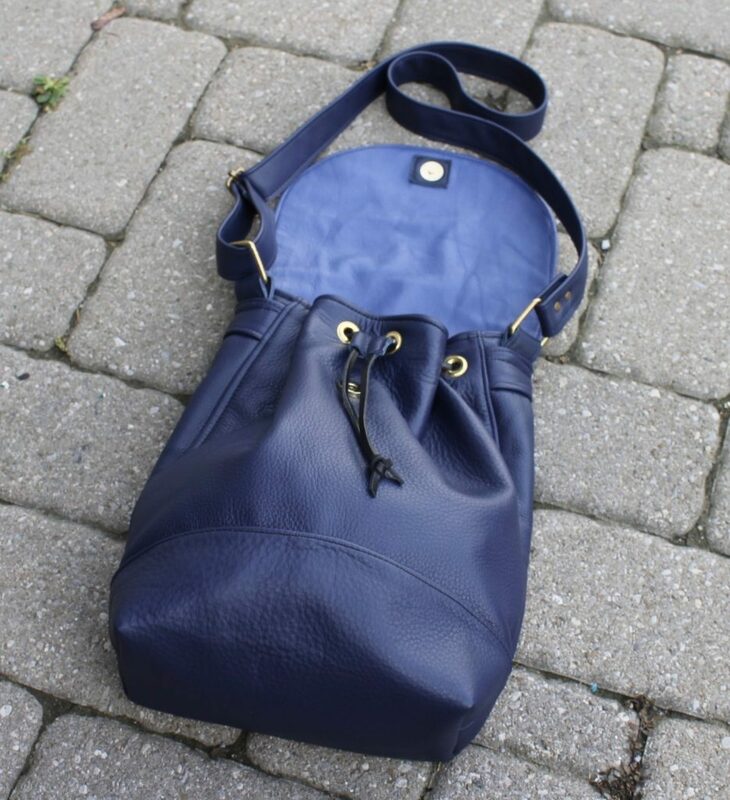 The bag measures 12″ wide, 13″ tall and 4.5″ deep and will easily carry all your essentials. Check it out in the online store, button in the menu at top.